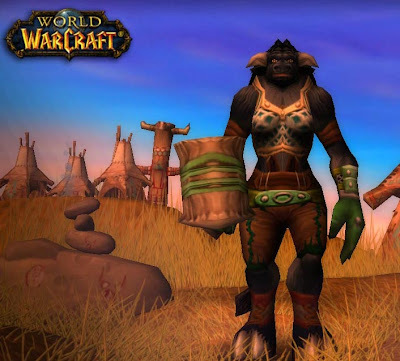 Wow, this is already my 150th post!!! I'm not one for much christmas decoration in my place (heck, I don't even have a tree), but every year I set up this little group on top of my TV (of all places). The cute thing about this is that this is part of a puzzle and all pieces fit together in a really small box. We are not much into christmas presents either. I did get a lovely, home-made bird feeding station from my nephews, but the birds haven't shown any interest in it so far. If they ever do, I'll be ready with my camera. However, as my sister mentioned that she wanted some wrist warmers (in black, if you please) I quickly whipped a pair up. 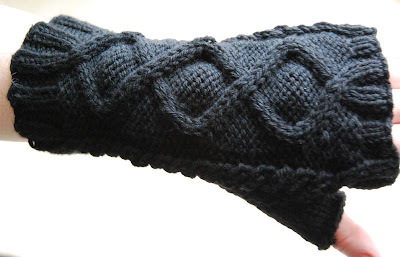 The pattern is inspired by Rose's wrist warmers, which I found on ravelery. 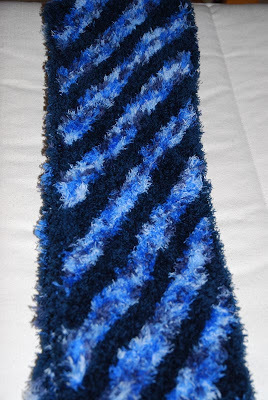 I did a couple of modifications, mainly because the yarn I used was a bit thicker than the one the pattern called for. I ended up with one extra, so in case my sister should ever grow a third arm (left please) I'm prepared. This third one (or rather the first one) was for testing the pattern and I decided, based on it, to change a few more things. 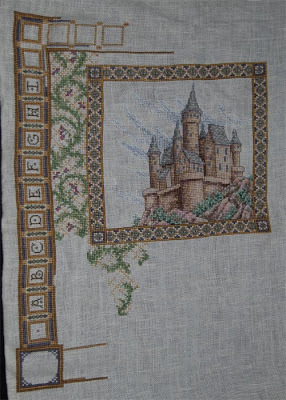 Other than that I've indeed went back to the Castle Sample for one last push to finish the monster. 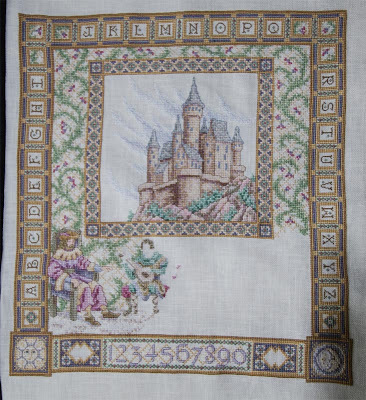 This is from before christmas, to mark the point when I finally finished the border - including all back stitches. Go me! 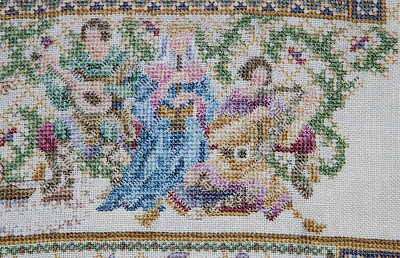 Since then I've finished the three musicians and the background around them (except at the bottom), but not the back stitching there. This will be my next task. 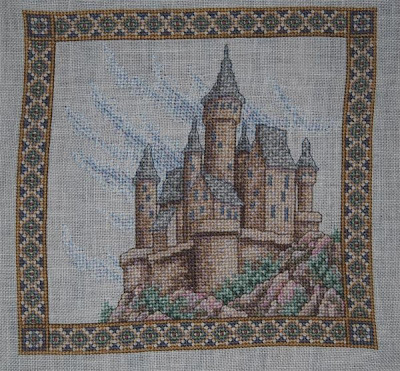 After then all left to do is the stitching lady on the right hand side and I'm done, done, DONE!!!! 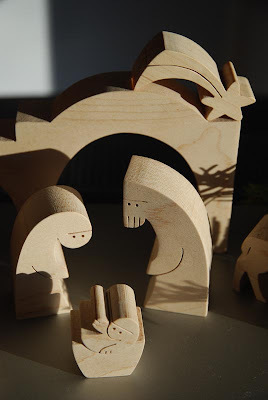 Only a couple of days to Christmas. Even though we don't normally give presents among the adults in my family (which does reduce the pre-chrismas stress by quite a bit) I do have one for somebody in the family. Though I can't say who. And what. So the picture will come up after the holidays. 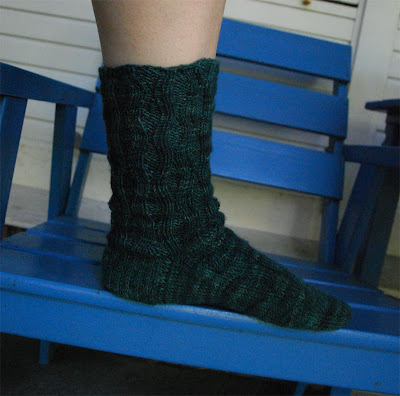 I did finish the Charade socks from last weekend, though. Now I'm not soooo sure about the colors anymore, but not enough unsure to say I hate them. I guess, they're still perfectly alright to wear in my boots and stop me from getting cold feet. 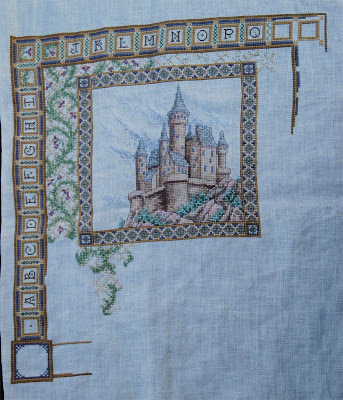 I also finished another project, which was a sort of made up on the spot - I have to wool - lets make something with it project. Even though I've started one more project for knitting (a simple, plain hat - nothing exciting in any way) I switched tracks, and went back to my x-stitch for a change. 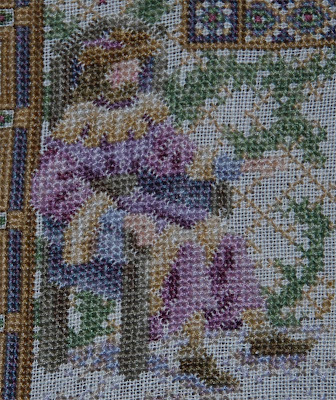 For the last two days I've stitched tiny green stitches in the border, over one, until I've got the feeling I'm getting blind. I'll make a pic as soon as I'm done with the border. Various disasters did strike last week, the most annoying one my phone, that simply stopped working. When I pick up the receiver I don't get a free line (well, I don't hear one) but when I try to call myself, it sounds like the line is free, only I don't hear a ring tone from the phone I'm calling and the answering machine doesn't pick up. I already checked the line, at it seems fine. I hope I can get it fixed tomorrow, even if that means I'm going to brave the pre-christmas shopping frenzy. I know, it's getting boring, but I'm still knitting socks. In the forefront is the first finished sock, in the back the start of the second. 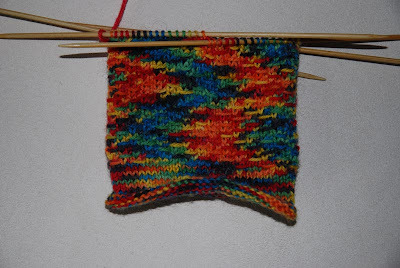 A fairly simple sock, but I love, love, loooooove how the colors are pooling. So much for this week's update. Torchwood is a British TV show with now two full seasons (13 episodes each) to its credit. The show is a spin off of the long lived SciFi TV show Doctor Who. It is set in Cardiff of all places and shows the adventures of a team fighting aliens and supernatural occurances which happen to come through a rift in time and space that happens to be in the middle of Cardiff. And as I was doodling, I thought it shouldn't be too hard to make a pattern out of it for knitting. I didn't get quite the 3D-ness the logo has, but for the resolution I had at my disposal (the pattern is 25 stitches wide) I'm not too unhappy. 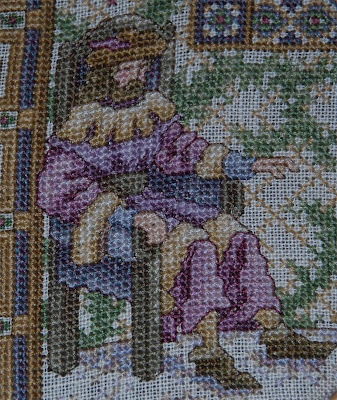 The knitting technique was a bit of a challenge, though. 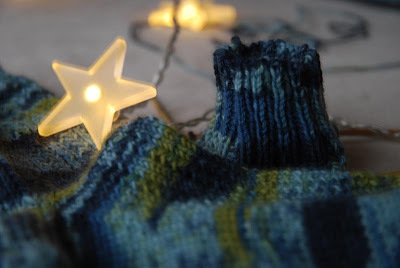 I know I could have easily stitched the pattern on top of the sock, once finished knitting it plain, but what would have been the fun in that? So I did a sort of intarsia in the round where in row 1 I did normal fair isle until I was a the other side of the the pattern (at this point the main and the contrasting color threads are hanging on this side of the pattern. 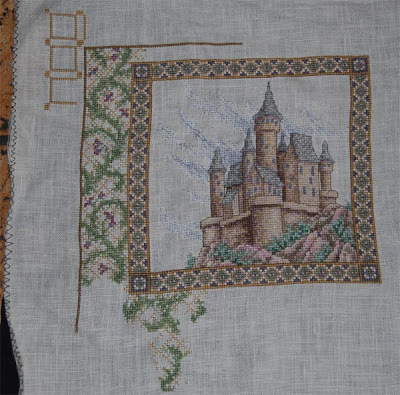 If I continue on, I would have had a problem with the contrasting color, as it would be on the wrong side of the pattern when I came back to it). So I turned around, slipped all stitches of the main color according to the next row in the pattern, but purled (after all I was on the wrong - inside - side of the sock now) all the contrasting stitches. 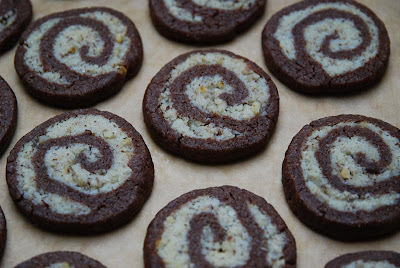 Now the contrasting color is again at the beginning of the pattern. 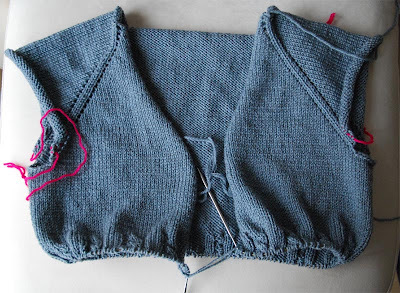 I turned the work again, slipped everything back to the other side of the pattern and continued knitting. 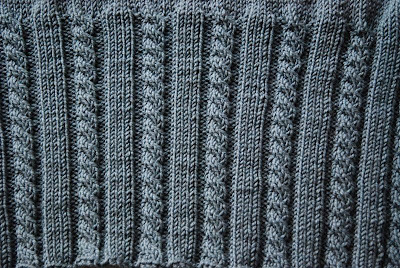 At the point I reached the pattern again (now in row 2) I knitted all the main color stitches and slipped the contrasting ones (they have already been knitted in the row before). Row 3 I worked like row 1 again and row 4 like row 2 and so on. Sounds complicates and in a way it is, but main thing is, it works. 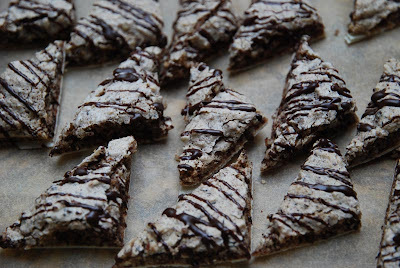 My cookie stash is already much reduced - my parents got some and I brought some to friends and collegues to quite positive comments. The sock yarn stash, on the other side, has grown thanks to a little trip to the Schoppel Wool factory sale outlet in Rodenbach. This year, I haven't made any of my standards (yet), though one is going to be close. 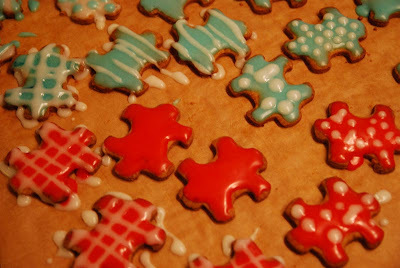 I got some of the dough left and made puzzled cookies. 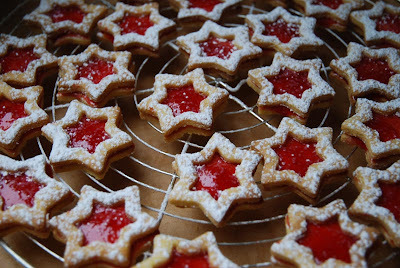 I did get the cookie cutter a couple of weeks back and sure I had to try something with it. Hurray, my new cardigan is finished. It took about a month, so not too bad on this front, especially, as I only knitted on the weekends. The patterns is Mr. Greenjeans from Knitty, the yarn Bingo Chinè by Lana Grossa. The construction is pretty cool and there's no sewing involved, which always is a big plus. After the wash last week, it's know a wee bit too big, but I don't mind really. The arms are about an inch too long, too, but that is more of a plus than anything, considering how cold it got. I'm not too happy about the collar, though, and am thinking about redoing parts of it (making it wider at the top. Other than that I'm making even more socks. I'm not quite sure what I was thinking when I bought the yarn last year, except maybe that sock from it will be warm for sure. It is pretty ugly, really. But the socks are perfect bed socks, and nobody but me will really see them, so never mind. I did go back to working on the Afgan now. It's been a while, and now that it really got cold, the thought of a nice cuddly blanket has some appeal. I dropped the idea of making a bedspread though. 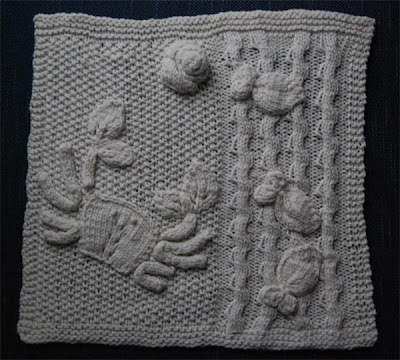 I've finshed 16 squares so far and with eight more I'll get a nice, proper sized blanky. And I won't need ot worry about getting more of the yarn. 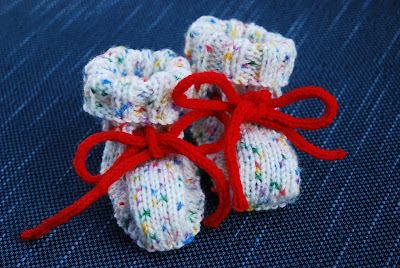 The socks that started out their live as Crusoe (because they were stranded (knitting ...) - you get it?) ended up as the miss-matched bright colored pair. Same pattern, same yarn. Same ball for a good bit, too. But totally different effect. I love the one on the right more than then one on the left. But I'm not going to rip them (or one of them) up! It is actually a quite pretty sock. ... because, that's what they are. 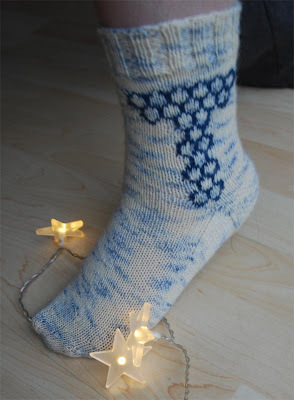 The pattern is from the favorite socks book, and actually the third pattern I did from this book. Or, rather, the fourth, as I started those with another pattern, which I then didn't like so much for this wool. 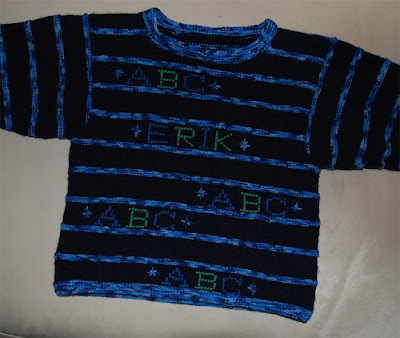 The yarn is actually the left over yarn from the pullover I made for my nephew. Remember, I need the some green yarn to stitch the letters and this sock yarn was the only color that came close to the color I wanted. It is a lovey sock yarn though, very nice and soft (Lana Grossa Meilenweit Merino). I would totally buy more of this yarn if I ever should come into the situation that I needed more sock yarn. You should see my stash. 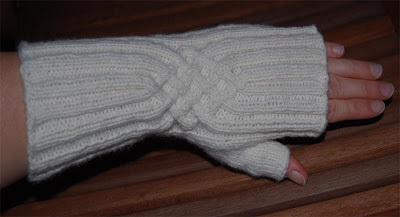 I realy enjoy knitting this. The contruction is pretty clever - no seams!!! 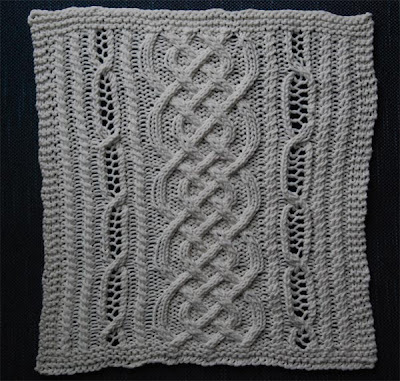 - and the cable pattern does keep is interesting. 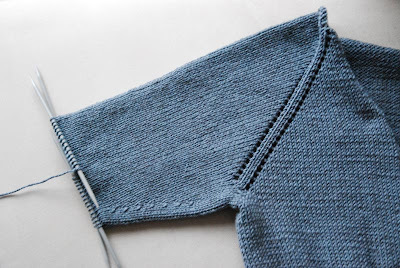 Cables are on the lower half of the body as well as the cuffs. I've just started on the twelvest ball of yarn. Good thing I went back and bought some more. I think I should be able to finish this with about a ball to spare. The heel caused me a bit of a headache - this is version three. 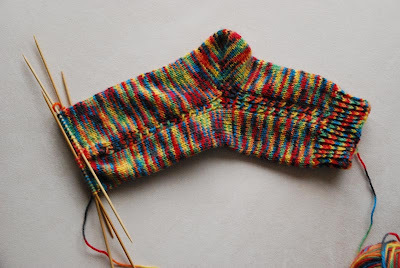 With the first heel (the 'classic' turned heel) the colors in the gusset section began to pool like crazy - but only there. 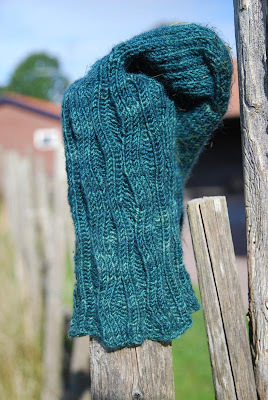 So I went to the frog pond and tried another heel (short row), but there I didn't like how the yarn crosses in the wrap and turn sections, so this was ripped as well. This here is okayish, but still not 100% what I wanted. Ah, well. The yarn, by the way is not as good as the first from this batch - I found a minimum of two knots in the first ball, and one already in the second. Means there's going to be a lot of weaving in the ends. Just a very plain, standard sock pattern (what we would call stinos - sticknormale Socken) The yarn did all the work and I seriously like them. I washed the swatch from last week and, indeed, it did relaxed a bit and grew by about 5%. So I did a recalculation of everything, scratched my head a lot, and decided to go on as I started. Just before the cable section started I slipped (as recommended in the pattern) all live stitches on some waste yarn and tried is on. It's an almost perfect fit with very little ease - so, accepting that it will grow a bit, I guess I'm all set. I had to go back to me yarn store, though, as I sort of forgot that when I switch yarns (as I did with this project) I might need to recheck the amount of balls I need. The first yarn had 120m / 50g and I bought 10 balls. Why I thought that buying the same number of balls of a yarn that has 80m / 50g is a bit beyond me. I've now have 16 balls, though I calculated that 13 should be enough. Right now I'm at the seventh. While in Sweden, we watched a lot of TV. And when I watch TV, I almost always do something crafty. The first thing I've started with was a new pair of sock. Basically, the travel sock bit (I started on the flight). 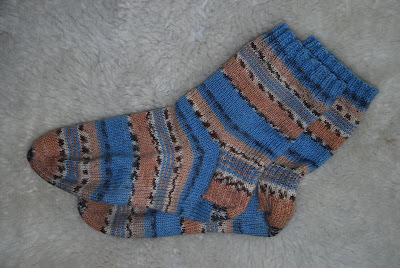 The pattern is the Mock Wave Cable Socks from the Favorite Socks book. The wool is JitterBug sock yarn, which I bought in Alaska last year. It is a fairly dark green, but maybe not quite as dark as in the first picture. Second project was a necklace my sister made a while ago for my other sister. I wanted to learn how. 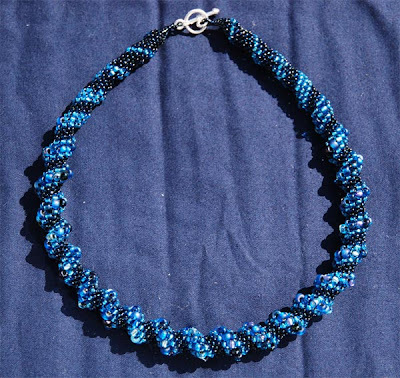 It's using the peyote stitch to create a circular tube of beads. 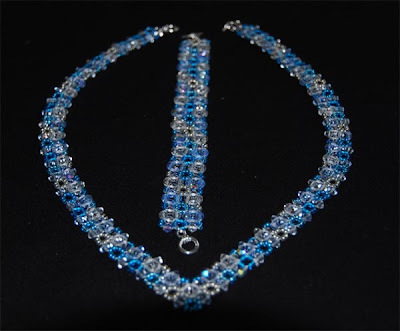 By using four different sizes for those beads, this spiral effect is create. It's actually pretty simple. 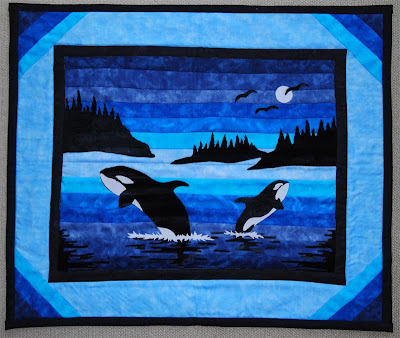 Another craft I wanted to try my hands on is quilting. And a small kit I've also bought last year in Alaska was perfect for it, as it covered several technics, without being too big. I did the quiliting in Sweden, but did the application back home. According to the kit you're supposed to add some beads for water droplets, but at the moment I like it just fine as it is. 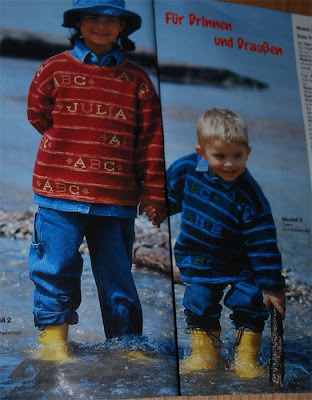 I also bought a magazine in Sweden called Right-Angle Weave from Bead & Button. 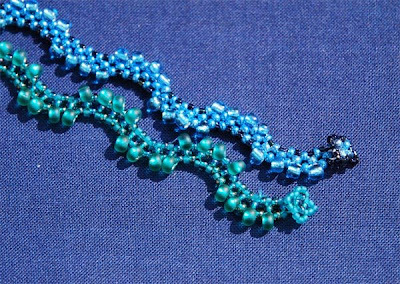 I started out with with caterpillar bracelet, but am not happy about my color choices, so I possibly will undo it again, and use the beads for something else. To staff off my frustration, I did just today two Wiggle Room bracelets, which are fun to make, and fast too. 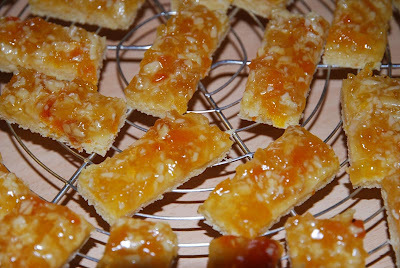 The second one took less than an hour. The green one is a bit too long, but the blue one is perfect and I'm wearing it as I type. 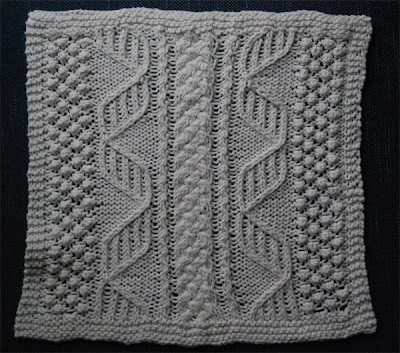 Ah, and I also finished another square for my Aran Afghan.